Posted on January 24, 2019 at 3:17 am. Today, many HVAC units are monitored and regulated by smart technologies which offer comfort, convenience, and energy efficiency. One of those is programmable thermostats which feature a network of sensors that control and constantly monitor the temperature all over the building. Investing in these devices is a good start to save up to 40% of the overall energy costs. Another way to reduce your office’s energy usage is by knowing and understanding where the energy is used and wasted. A comprehensive energy audit helps identify the errors in the HVAC system, repair, and maintenance services through a full inspection. All potential factors such as the number of occupants and the system’s performance are taken into consideration. An energy audit makes it easier to find and fix the problem. With well-operating heating and cooling systems, you have better control of your system’s energy usage. Therefore, if anything goes wrong in your HVAC equipment, do not delay any repairs. Act on it promptly as soon as you notice the issue. Putting off repairs may result in more expensive repairs and system breakdown. Stop the problem before they even occur. A professional HVAC preventive maintenance goes a long way when energy efficiency is concerned. If regularly checked and maintained, your commercial HVAC system would work at peak efficiency even under extreme weather conditions. A new HVAC system is a big investment, but it can boost your savings and comfort. You might need to install retrofits before replacing the system entirely. Consult your contractor regarding retrofits for information and assistance. Insulation is not just about sealing cracks around the windows and walls of the building. Your HVAC system needs it the most as far as pipes, ducts and electrical outlets are concerned. Make sure they are properly insulated to keep high energy costs at bay. 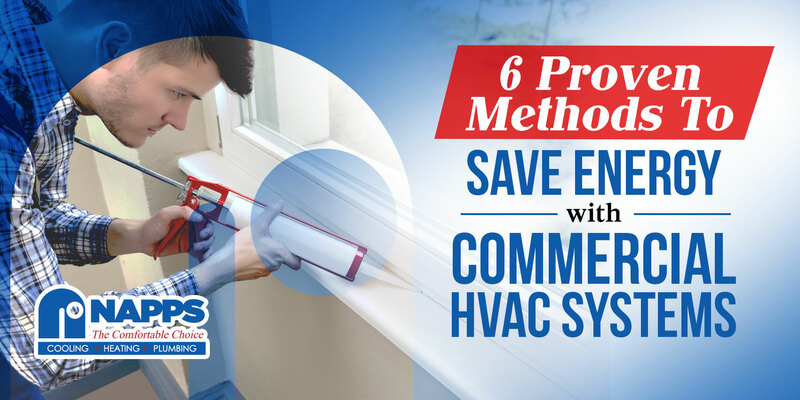 With the high cost of running commercial HVAC systems, these expert tips can give a hand on your energy-saving goals. Contact us at Napps Cooling, Heating & Plumbing for more friendly tips. Keep in touch with us to learn more!